Using the LE player controller in a terrain with trees. I put a crate with 10 of mass. Game start -> Game crashes. I removed the mass of the crate: Game start -> Game runs. Edit, the bug does not occur if no trees (+ collision) with the vegetation tool on the map ! Did you update your project so you have the current Newton DLLs? Ok I will definitely look into this. Thanks for reporting! Can't produce from your description. It's either fixed or I need a working sample. 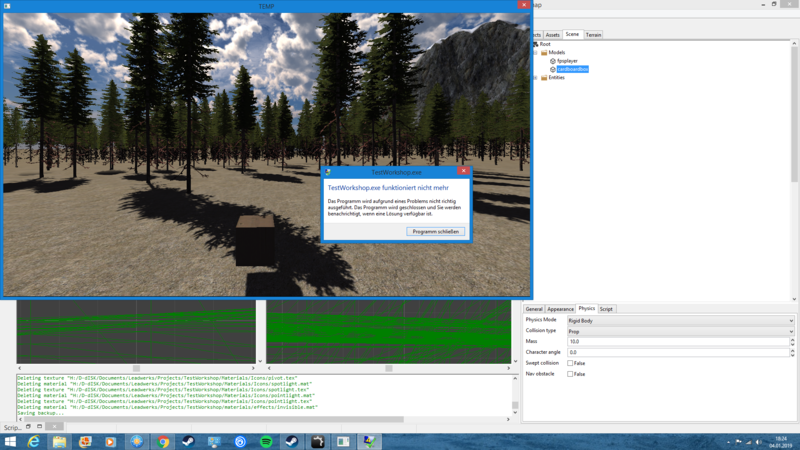 I tryed one more time and the bug occurs as soon as a box has a mass AND vegetation tool (pine tree) WITH collision. If you remove the collision from the vegetation tool, the bug disappears ! Did you test with vegetation tool collision checked ? The Zone map works fine. Try it after the next update and let me know if there is still a problem.